The Gresham Royal Marine is a beautiful building set on four acres of landscaped gardens and it overlooks Dublin Bay and Dun Laoghaire harbour. 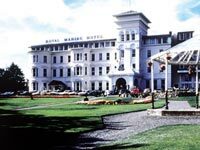 Only 20 minutes DART ride from Dublin's city centre, the Royal Marine offers superb conference facilities. All of the 103 rooms feature the following amenities: 24 Hour Room Service, Voice Mail, Direct Dial, Telephone, Radio, Remote Control Television, Hairdryer, Garment Press, Same Day Laundry Service, Tea & Coffee Facilities (on request), Non Smoking Rooms (on request), Electronic Safety Locks. The elegant Powerscourt Restaurant offers guests delicious cuisine. Breakfast is served until noon each day. There's the Bay Lounge which is renowned for its sumptuous afternoon tea. At Toddy's Bar you can enjoy cocktails, lunch or a light dinner. There are many fine restaurants in the vicinity. Dun Loaghaire is a vibrant port and town about ten miles south of Dublin city centre. The area is rich in heritage sites and other visitor attractions and has its own theatre, dance school and multiplex cinema, as well as a rich array of shops, cafés and restaurants.